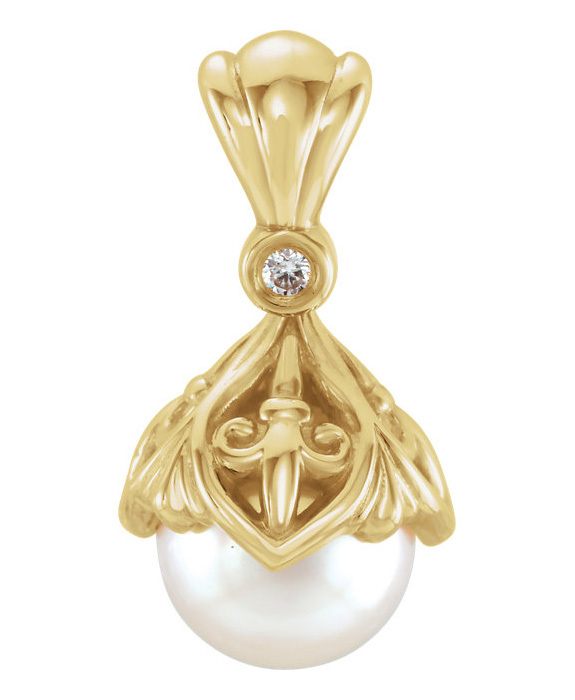 A beautiful and feminine fleur-de-list pendant in 14k gold set with a 7 - 7.5mm genuine freshwater pearl. The fleur-de-lis freshwater pearl pendant is set with a real 0.02 carat genuine diamond just beneath the hoop in G-H Color, I1 Clarity. The pendant measures 9/16" tall x 3/8" wide. We guarantee our 14K Gold Fleur-de-Lis Freshwater Pearl Pendant to be high quality, authentic jewelry, as described above.